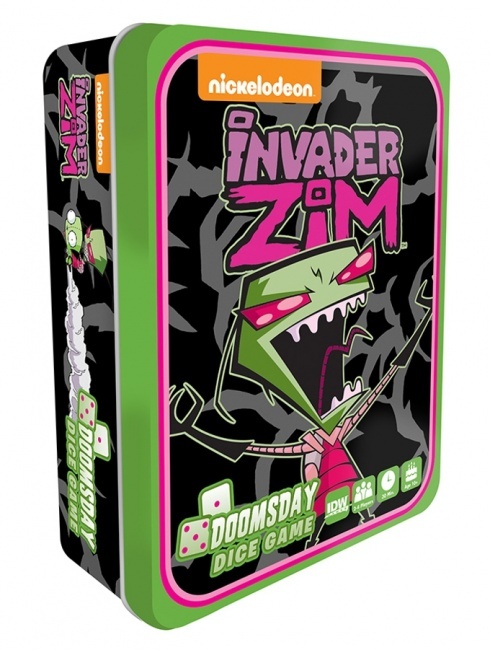 IDW Games will release the Invader Zim Doomsday Dice Game on September 26. Based on the cult animated series, the game has players take the role of Zim, Gir, Dib or Agent Darkbootie. The Almighty Tallest have ordered Zim to destroy the Earth with crazy contraptions. Dib and his cohorts at eh Swollen Eye network are attempting to subvert those plans. Players draw cards to build a machine to either destroy or save the Earth, connecting matching cards and earning power surges that allow players to roll the BIG DIE. If enough power is generated, players may even get to roll the tiny special die. But rolling either can end in malfunctions or worse, a complete loss of power. The first player to earn 100 energy wins, and every else owes them taquitos. The box includes 64 cards, 4 player boards, 8 power trackers, 16 special ability tokens, power surge die, special die, and a rulebook. The game is for 2 � 4 players, ages 14 and up, and plays in 20 � 30 minutes.